The City of Syracuse has made modifications to parking along Euclid Avenue that will affect students and other members of the campus community who park on that street during the day. The parking changes, which were made to better accommodate bicyclists, pedestrians and buses, have been posted and are in effect year-round. The changes now limit parking only to the south curbside of Euclid Avenue between Ostrom Avenue and Westcott Street. This ban on northside parking eliminates the previous odd-even parking regulations and allowed for the addition of new dedicated bike lanes for both eastbound and westbound bicyclists. 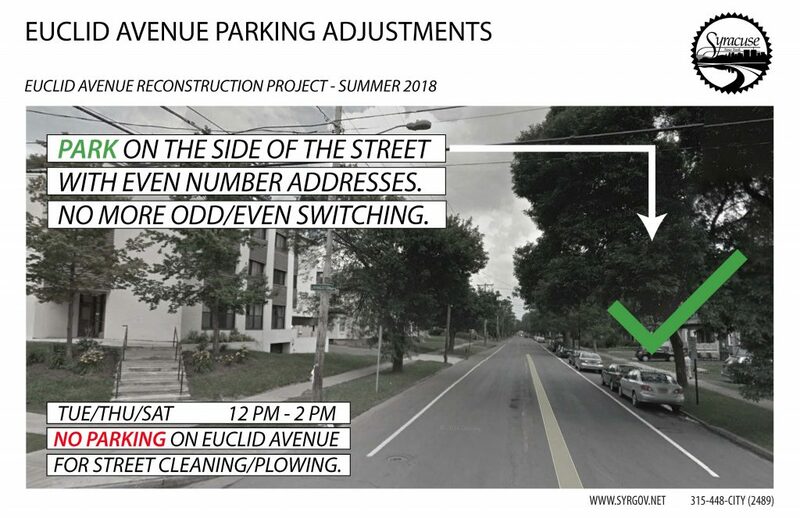 In addition, parking along the south curbside of Euclid is prohibited between noon and 2 p.m. on Tuesdays, Thursdays and Saturdays to allow for street cleaning and/or plowing. The midday times were chosen by the city to minimize congestion during the a.m. and p.m. workday traffic rush and to allow students and residents to continue parking their vehicles on the street overnight. City transportation officials say the midday restriction is considered best practice in many snowbelt municipalities. The restriction does mean, however, that those parking along Euclid during the day on Tuesdays/Thursdays/Saturdays—including game days—will have to move their cars between noon and 2 p.m. or risk getting ticketed. The parking changes were made as part of the city’s Euclid Avenue improvement project to promote safety for all types of traffic, including bicyclists and pedestrians, along a stretch that is heavily used by students, employees and others entering and exiting the campus via Euclid. The project complements upcoming Waverly and Comstock Avenue improvement projects that together will create six miles of continuous bike lanes from the eastside to downtown. The city earlier this month also began more strictly enforcing longstanding two-hour parking limits in Thornden Park. The restrictions, which are posted, are designed to ensure parking is available for park visitors, who can face difficulty finding space, especially during the academic year. Campus employees and students who had been using Thornden Park for all-day parking are urged to make alternative arrangements. For more information on campus parking options, contact the University’s Office of Parking and Transit Services at 315.443.4652 or parkmail@syr.edu.